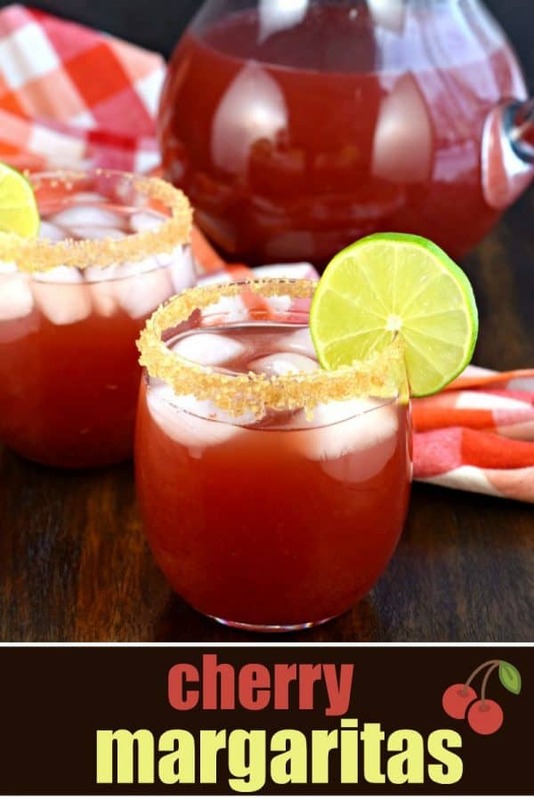 Whip up a pitcher of these Cherry Margaritas for your next summer party! Perfect for a crowd, and packed with flavor! Margaritas. The drink of choice whenever I go out. Most bartenders can make them nice and strong over rocks, so it’s always my go-to option. But at home? I rarely make them. I tend to go for a mixed drink or a beer (so lazy, I know). A few months ago I had such a taste for these Cherry Beer Margaritas. They’re so tasty and easy. Except I was out of 7-up! So I did the next best thing and made a pitcher of tart Cherry Margaritas. And now I’ll be keeping some simple syrup ready in my refrigerator for all my summer drinking! Start by making a simple syrup, using 2 cups of water and 2 cups of granulated sugar. Heat in a saucepan over medium heat, stirring constantly until the sugar dissolves. Set aside. Next, pull out the blender and add in 2 cups of frozen tart cherries (with pits removed). You can also use fresh if desired. Blend with the simple syrup. In a large pitcher, combine the cherry mixture with a whole bottle of tequila (750ml), 2 cups of triple sec, and 2 cups of lime juice. Stir and serve over ice. 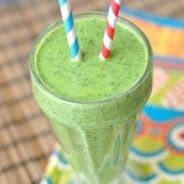 If you prefer a blended (slushy) margarita, pour everything into your large blender (or do about half of the pitcher) and add ice until it’s a desired consistency. 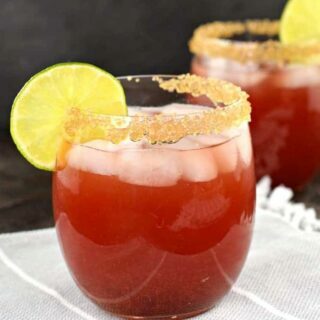 For a delicious garnish, dip the rim of your glass in simple syrup and then in coarse turbinado sugar. Add your cherry margarita to the glass with ice, and a lime for garnish! ENJOY. 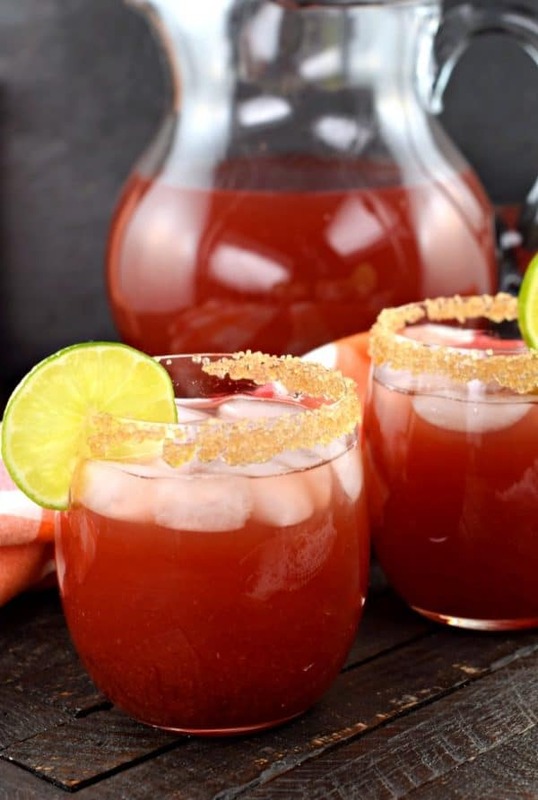 This Apple Cider Sangria is the perfect holiday beverage! Make it a day ahead of time for best flavor! 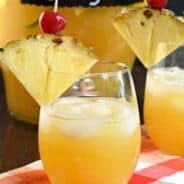 Need a batch cocktail for your next party? 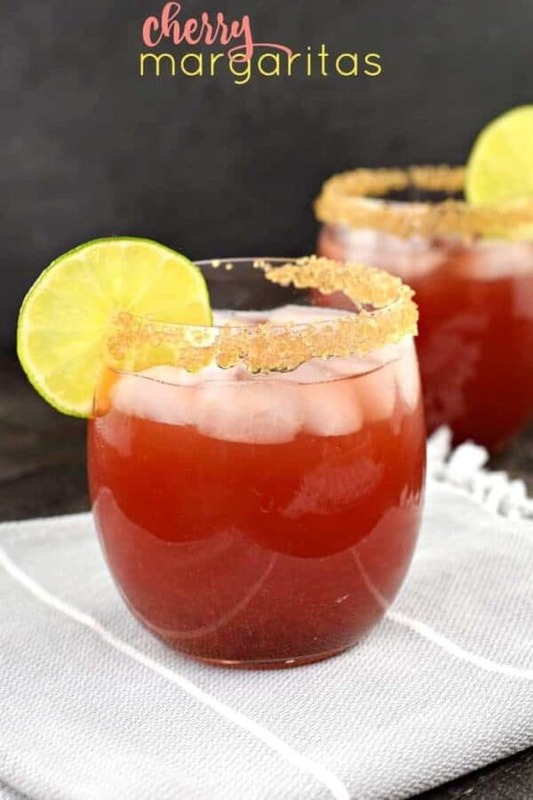 Look no further than these gorgeous Blood Orange Margaritas for a crowd, from Garnish with Lemon. This Hot Pink Summer drink recipe from Real Housemoms is light and refreshing and because you make it in a pitcher it’s the perfect drink for a summer party!!! In a small saucepan, make a simple syrup by combining the water with the sugar. Whisk over medium heat until sugar is dissolved. In a large blender, combine simple syrup with frozen cherries (or fresh). Blend until pureed. 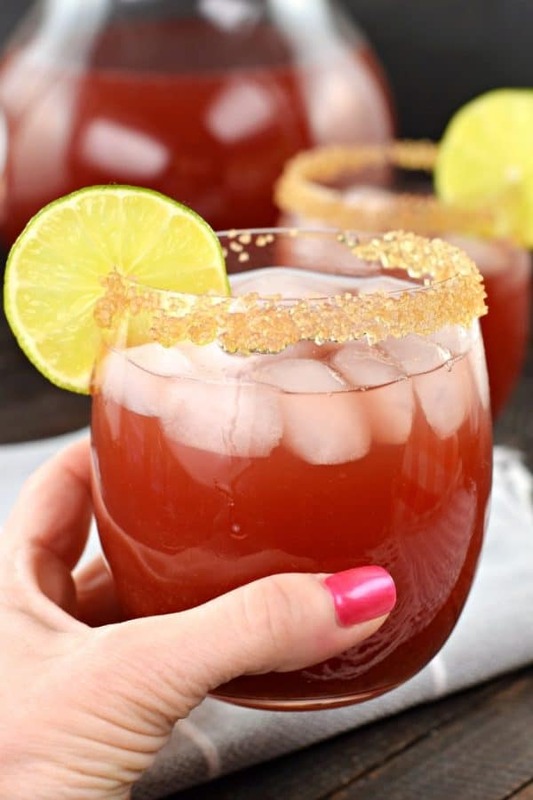 For the pitcher of margaritas, combine cherry mixture with tequila, triple sec, and lime juice. Refrigerate or serve immediately, stir together. To garnish the glass, dip rim of glass in extra simple syrup (or water) and then dip in turbinado sugar. Add ice and margaritas. Place a slice of lime on each glass, enjoy! Yum! 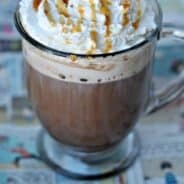 You don’t see a lot of cherry drinks recipes, so love that this is different. Plus, what a great roundup of other choices! We’re moving this summer, so pretty sure I’m going to need all of those. Thanks, Aimee! You’re welcome. Good luck with your move! !